We are an inter-generational church which welcomes students. If you are in college or university, we invite you to consider making Stony Brook your Christian home. We’re a loving place where you can learn about apostolic Christianity, become more integrated into the community and have opportunities to serve your neighbors. Since its founding, Stony Brook Church has always extended a warm welcome for students from the Five Colleges. You are always welcome here, no matter where you are in your journey with God. 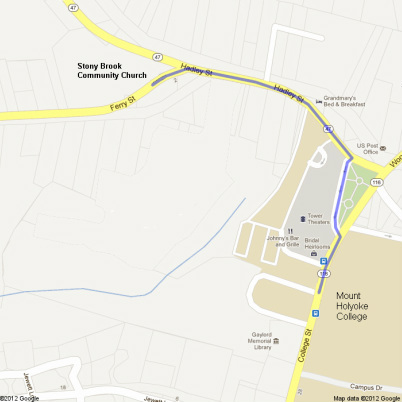 The map shows the walking route to our church from Mount Holyoke College, our closest campus. It's about a 10 minute walk from the student center.